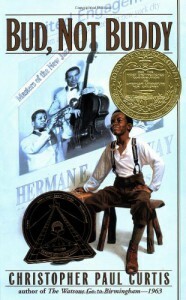 We read Bud Not Buddy in 5th grade as a group study. I think this book is a good historical fiction that would get kids interested in learning more about the Great Depression. It has such vivid detail, it gives you a little glimpse into what life was like while telling an interesting story of Bud trying to find his father. Would use this as a social studies tie in.